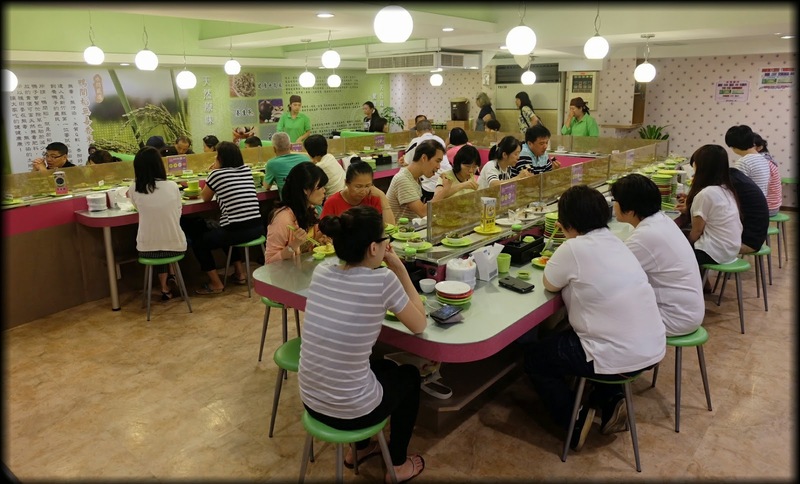 Shuiwen (水問蔬食園) is a vegetarian kaiten-sushi restaurant in Taipei. 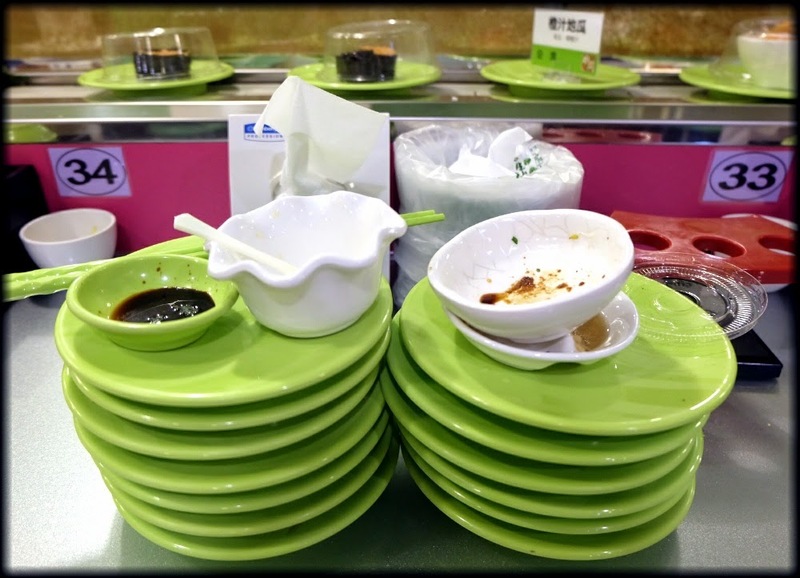 Kaiten sushi are the famous sushi restaurants in Japan (and now the world over) in which customers select their dishes from a conveyor belt. 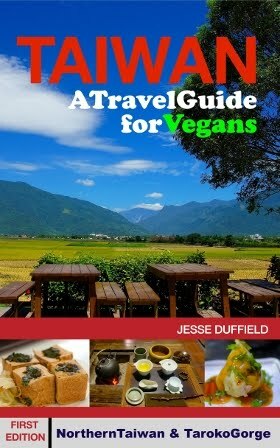 In rural Japan (or rather most of Japan outside the main centres) these are often the only places to find (hopefully) vegan food, but there's always the risk of fish flakes and various other additives. 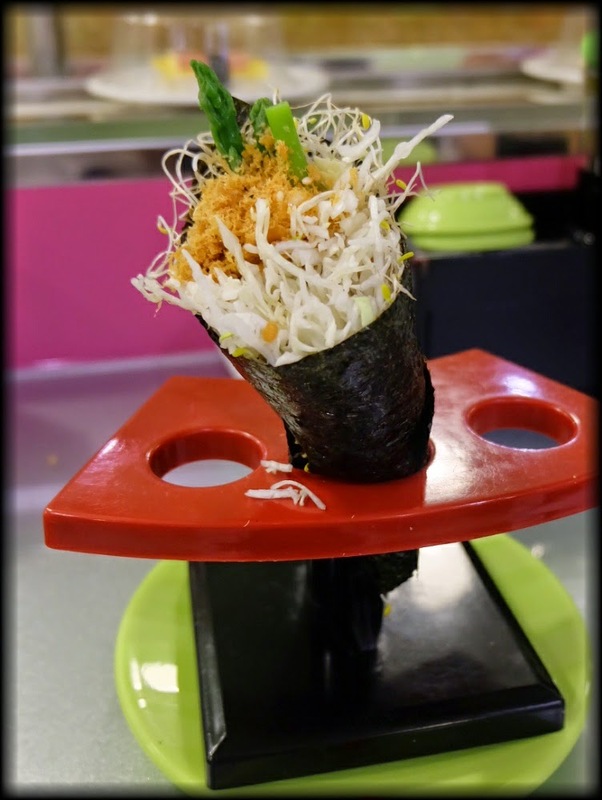 So this restaurant beats any in Japan for vegan sushi. This is only about half of the restaurant. It was a rather long conveyor belt, and a tiny kitchen producing it all, so it must run to Japanese efficiency. In Japan plates are colour coded according to cost. 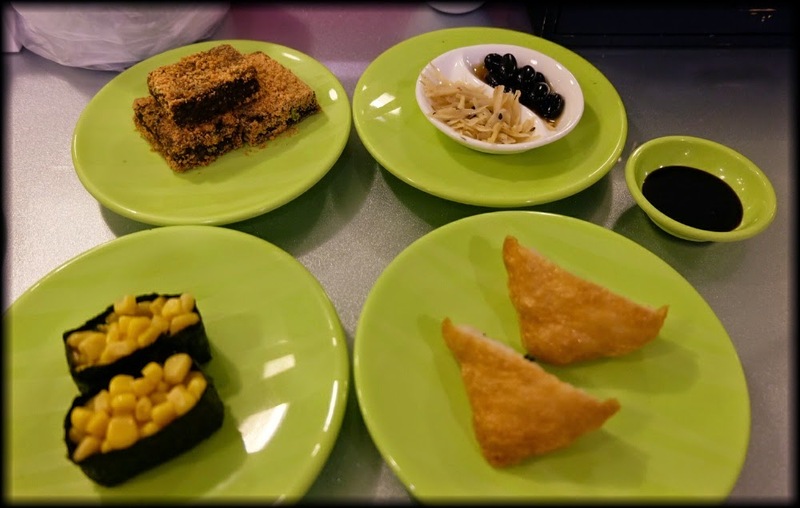 Since vegan options are generally considered snacks, a vegan meal is often absurdly cheap, and I've sometimes wondered if staff just think I'm being a cheap foreigner. 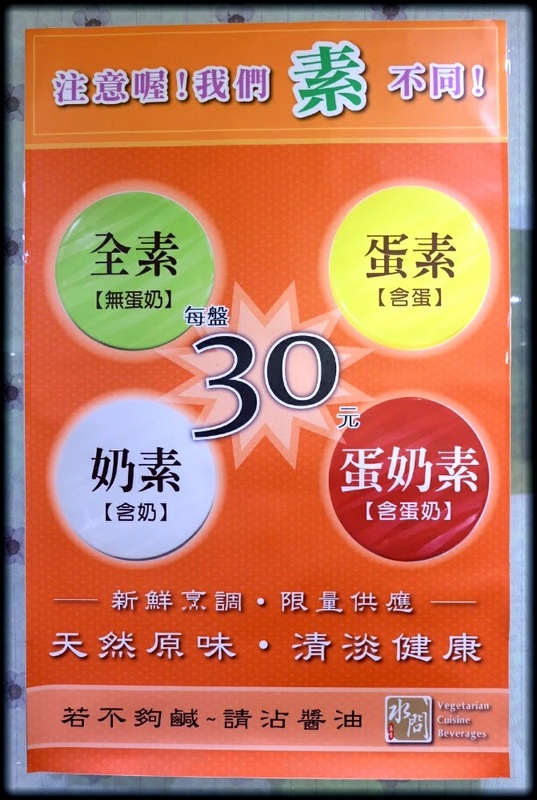 Shuiwen takes an interesting twist on this: plates are colour coded according to vegetarian status: green for vegan (of course), white for lacto, yellow for ovo and red for lacto-ovo. All plates cost 30NT. This poster explains the colour coding (green for vegan). Dishes are preceded by a plate with a label, but it's not really necessary to understand what they are. The green plates are vegan, and from there it's just a case of choosing what you like the look of. As in Japan, ginger, soy sauce and wasabi are free (help yourself as the ginger comes around). 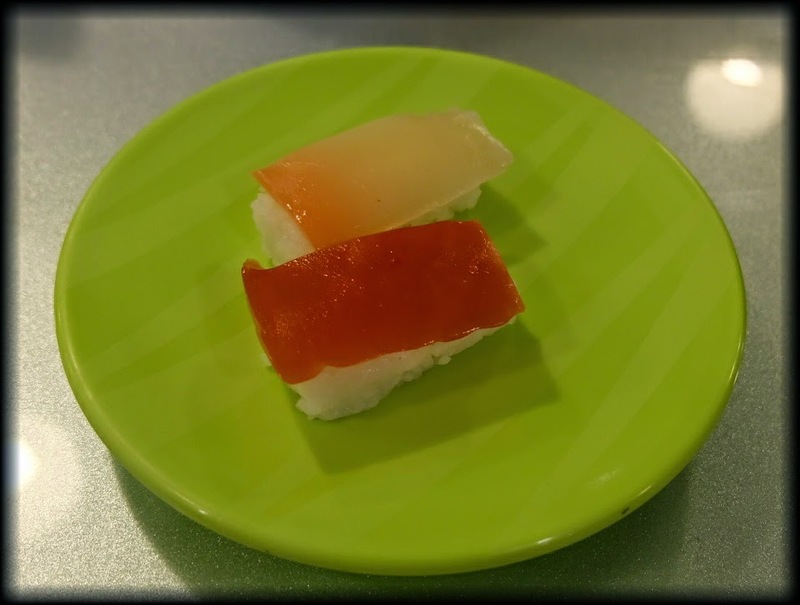 Some dishes were disturbingly like 'real' sushi. 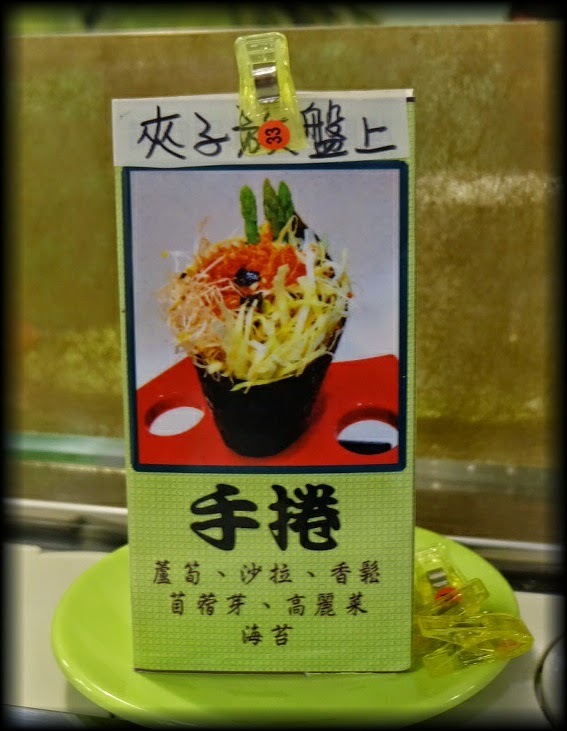 Most common (vegetarian) Japanese favourites were there. And some more Taiwanese dishes were also on offer. 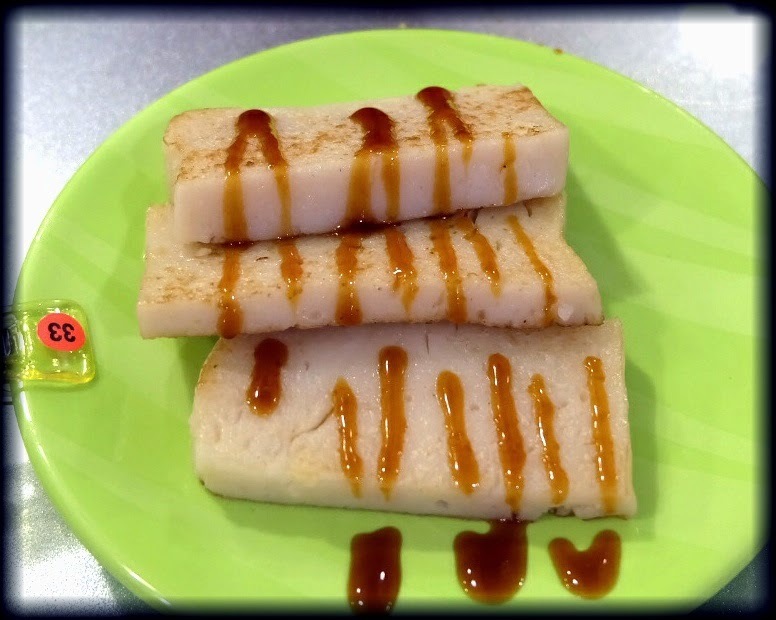 Not so Japanese: these radish cakes are a traditional Taiwanese favourite. Some dishes which must be eaten straight after they are made, or must be eaten hot (including the radish cake above) need to be ordered. Take a peg from a bowl in front, and attach the peg to a piece of cardboard as it comes around, or just add it to the saucer. A little while later, your dish will be delivered to your plate. I assume they are batch-made, so they may take some time. So be sure to keep track of how much you have ordered. A little while later your meal will be delivered. 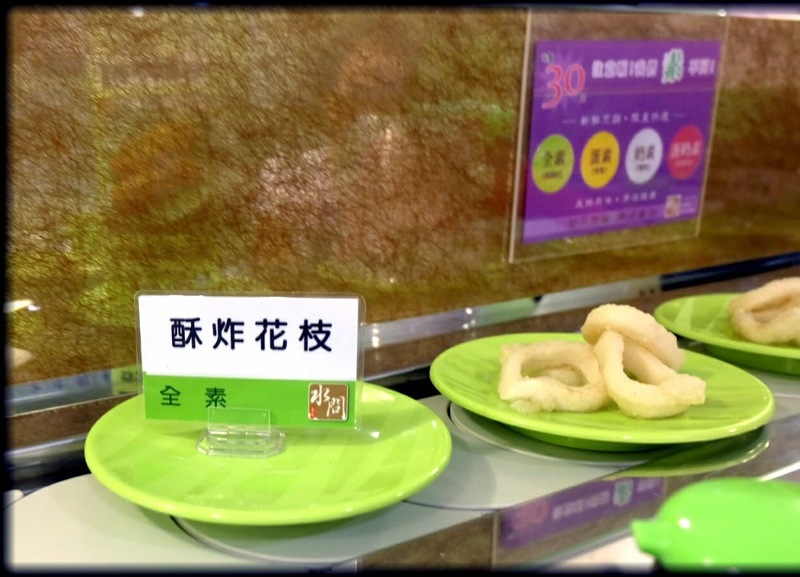 They also serve some (more Taiwanese-style) desserts. 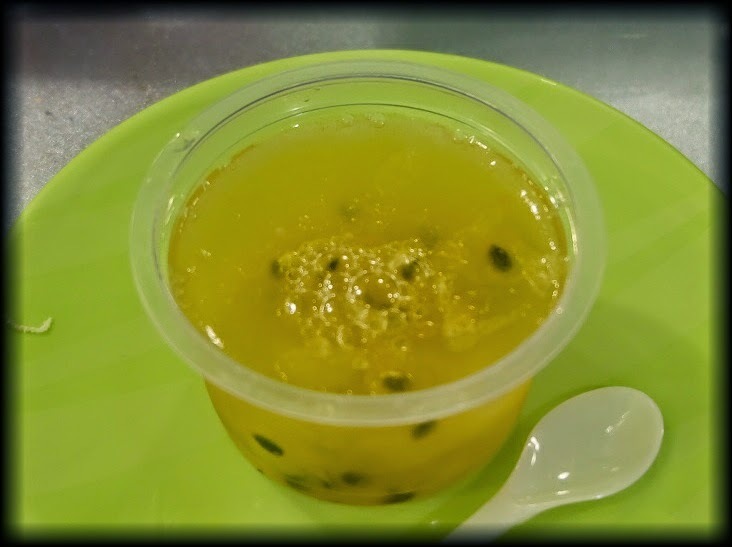 This passion-fruit jelly was a delicious conclusion to my meal. Be sure to always take the dishes with their plate (even if it seems unnecessary) and keep your plates beside you, as they are used to count how much you eat to determine your bill. 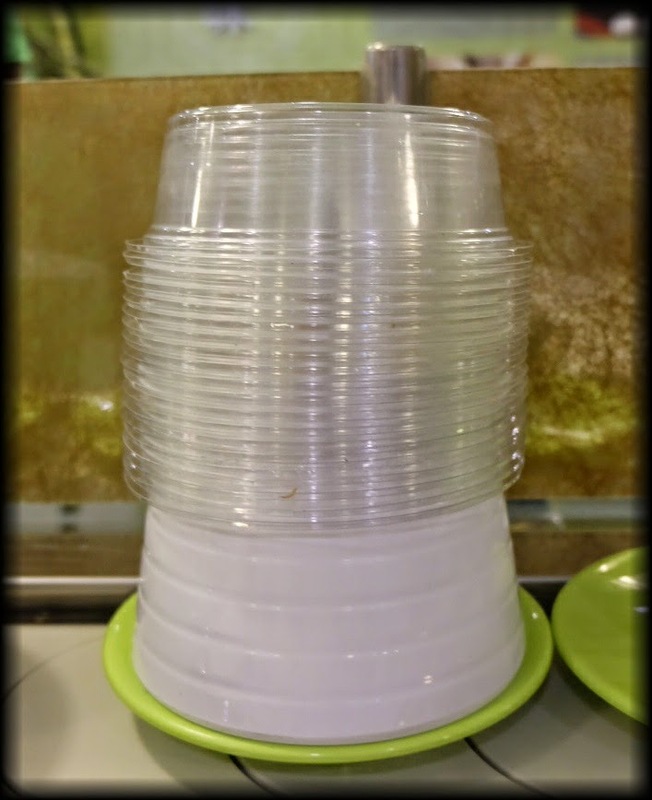 Plastic lids, however, can be placed on these stacks to clear your table as you go. At about a dollar a dish, prices are very reasonable. On my visit I'd hardly eaten all day, so I had an absolute feast for 390NT, but for a 'normal' person under normal circumstances about half that would probably be sufficient. Thirteen plates was a feast for one person. 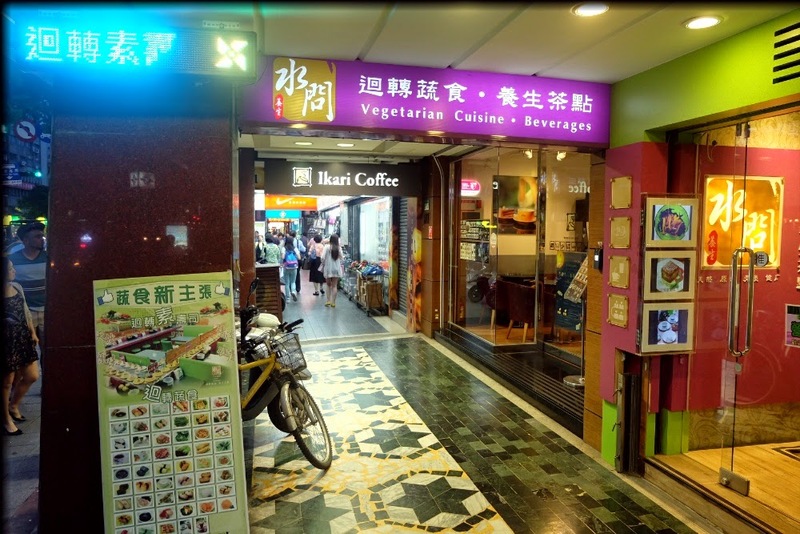 To get to Shuiwen, take the new orange line to XingTian Temple Station. Take exit 3, turn right and it's a couple of doors down. The restaurant is well sign-posted, and stairs lead down to the basement.